fax:(706) 356-8842 Hybridized by the late George Beasley, named after his wife, the late Mary Shuss Beasley. Family values along with quality grown product are two of the tenants that have guided The Beasley Family during their 34 years of owning and operating Transplant Nursery. Owners Jeff and Lisa Beasley are proud to announce on August 14, 2014 that Transplant Nursery will now be set to grow for future generations. They have closed a deal with their daughter Camilla and son in law Gatlin to claim their spot as owners of the family business and continue the legacy of quality grown plants. Fulfilling what has been a long term dream to pass the nursery down to his children, Jeff will remain hands on involved with the nursery for a number of years. During this period he will continue to serve as an advisor to Gatlin while focusing on plant health and quality, nursery maintenance and daily operations. Lisa will remain involved as well continuing to handle bookkeeping duties for the company. Jeff's father, the late George Beasley, was an avid plant collector. George brought plants home from everywhere he traveled and these became the backbone of his own garden which still offers breathtaking beauty each spring. His first love was Camellias, then wild flowers and finally the rhododendron species. 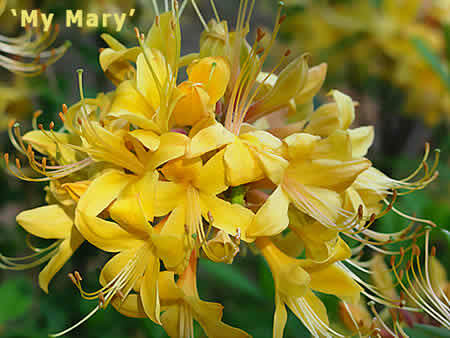 He started a hybridization program with Native Azaleas which resulted in crosses which are still in the trade today. His retail mail order catalog created interest and sales from plant enthusiasts in many states. As he sometimes would say, he started a nursery in order to help finance the many plants he saw and absolutely had to have. At thirteen Jeff was taught by his father how to hybridize Native Azaleas and he became interested in all facets of growing plants. In 1980, Jeff and Lisa, his wife, started working in the small nursery. After a short time growing plants, it was very apparent to them that the nursery industry was where they wanted to spend their lives. George died in 1984, but Mary, his wife, and Lisa and Jeff continued to operate the business as a retail mail order nursery. After Mary retired in 1988, Jeff and Lisa discontinued the retail mail order business to focus their available resources on wholesale customers. Mary Shuss Beasley died late Summer of 2010. She will be greatly missed by the family and all who knew her. The Nursery has been successful offering quality products and service to the wholesale Green Industries. Transplant Nursery's staff is knowledgeable and caring. They consider quality and honesty to be their greatest assets. Their pledge to you is that they will continually strive to meet the needs of their customers while always delivering a quality product at a fair price.